Transform the way you communicate with the hidden “complexity codes” that shape behavior. From the boardrooms of big business to the streets of the inner city, from the south side of Chicago to apartheid South Africa, Dr. Don Beck has taught people at all levels how to stop clashing and start communicating. His method is called Spiral Dynamics Integral, a revolutionary new way of perceiving human nature that lets us understand, predict, and resolve even the most difficult conflicts. 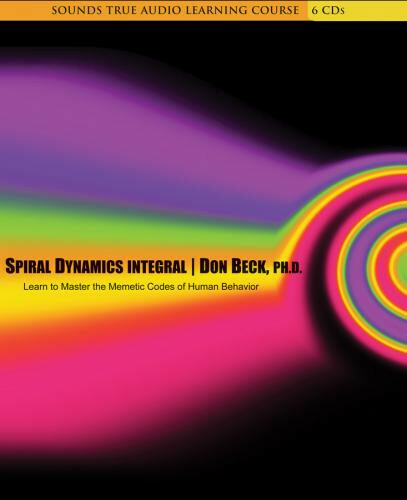 In his effort to map the genome of the mind, Dr. Beck has created a tool he calls the Spiral, which charts the underlying reasons for virtually everything that human beings think, believe, and do. Breaking down the "complexity codes" that lie at the heart of a problem, he explains, is the first step toward coming up with a real, lasting solution. If you have been perplexed buy the state of the world around you. If you have ever asked why are their such differences in cultures, business, countries . rich and poor, politics, schools, or even why you seem to be changing and those close to you are changing coming together or drifting apart? If you want to finally see an academic apply their theory to real people and big complex problems in the REAL WORLD! If you want a sense of useful hope that puts tools of powerful change in your hands.